Platinum is a chemical element wi the chemical seembol Pt an an atomic nummer o 78. Its name is derived frae the Spainyie term platina, which is leeterally translatit intae "little siller". It is a dense, malleable, ductile, precious, gray-white transeetion metal. Platinum haes sax naiturally occurring isotopes. It is ane o the rarest elements in the Yird's crust an haes an average abundance o approximately 5 μg/kg. It is the least reactive metal. It occurs in some nickel an copper ores alang wi some native deposits, maistly in Sooth Africae, which accoonts for 80% o the warld production. As a member o the platinum group o elements, as well as o the group 10 o the periodic table o elements, platinum is generally non-reactive. It exhibits a remarkable resistance tae corrosion, even at heich temperaturs, an as sic is considered a noble metal. 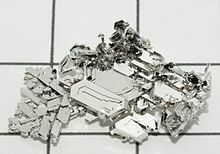 As a result, platinum is eften foond chemically uncombined as native platinum. Acause it occurs naiturally in the alluvial sands o various rivers, it wis first uised bi pre-Columbie Sooth American natives tae produce artifacts. It wis referenced in European writings as early as 16t century, but it wis nae till Antonio de Ulloa published a report on a new metal o Colombie origin in 1748 that it acame investigated bi scientists. Platinum is uised in catalytic converters, laboratory equipment, electrical contacts an electrodes, platinum resistance thermometers, dentistry equipment, an jewelry. Acause anly a few hunder tonnes are produced annually, it is a scarce material, an is heichly valuable an is a major precious metal commodity. Bein a hivy metal, it leads tae heal issues upon exposur tae its salts, but due tae its corrosion resistance, it is nae as toxic as some metals. Compoonds containin platinum, maist notably cisplatin, are applee'd in chemotherapy against certaint types o cancer. ↑ Harper, Douglas. "platinum". Online Etymology Dictionary. Nuclides an Isotopes Fowerteent Edeetion: Chart o the Nuclides, General Electric Company, 1989. This page wis last eeditit on 26 Februar 2018, at 23:54.